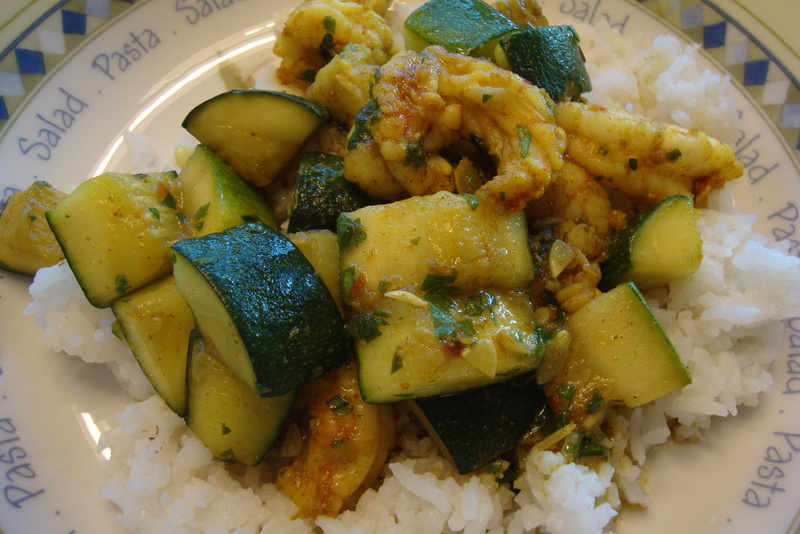 Warm Indian spices are the perfect match for fresh-from-the-garden zucchini and shrimp! I’m back! It’s been over a month since I’ve been able to post a new recipe, but I’m hoping to catch up over the next few weeks. I have, however, been able to post some interesting articles and delicious looking recipes on our Facebook page and on Pinterest. Be sure to check us out there for your regular This Is So Good fix! So while the month of June was super busy, I did manage to plant my garden and the combination of hot weather and heavy thunder storms have really made it grow. I harvested 3 large zucchini last week. I saw a version of the following recipe on one of my favorite recipe sites, Serious Eats. I cleaned it up a little to make it more “Paleo” and added another 1/2 pound of shrimp. There is no way that a 1/2 pound of shrimp would ever be enough food for both of us! We eat white rice a few times a month and have no ill effects from it. I paired this dish with Basmati rice and it was perfect. If you stay away from rice, a simple substitute would be cauliflower “rice”. Mix the shrimp and 1/2 teaspoon of the turmeric in a bowl and set aside. Melt 2 Tablespoons of coconut oil in a wok or large skillet. When the oil is very hot, add the shrimp and fry until they turn pink (about 1 minute per side). Remove the shrimp to a plate and set aside. Add the remaining oil to the wok and then add the rest of the turmeric, bay leaf, crushed red pepper flakes, cumin, coriander, and ginger. Continue stirring for about a minute and then add the zucchini to the wok. Toss them well to evenly coat them with the spices. Cover the wok and cook the zucchini (stirring occasionally) until they are softened, about 8 minutes. Add the shrimp and cilantro and cook for 1-2 minutes to re-warm the shrimp. Remove from the heat and enjoy! Cilantro, Coconut oil, Coriander, Crushed red pepper flakes, Cumin, Ginger, Shrimp, Turmeric, Zucchini. Bookmark.